Why not join our very friendly U3A group and give it a try. There is no need to bring a partner and we cater for both beginners and those with some experience. In 1651 the music publisher and book seller John Playford began to publish the music and notation for the “Country Dances” that were popular in the elite society of the time. When Playford died in 1686, his son Henry continued the collection and other publishers joined in. By the end of the eighteenth century country dancing was popular at balls, assemblies and private gatherings all over the country. In the early 1900s, Cecil Sharp began to study the Playford collections, and he produced a number of Country Dance Books. Since then, other dances have been discovered and many new dances have been devised, using the traditional style. Now we have a wealth of material at our disposal, from fast and furious to slow and stately, and everything in between. Beginners taster sessions on the first Friday in the month. Why not gives us a try! 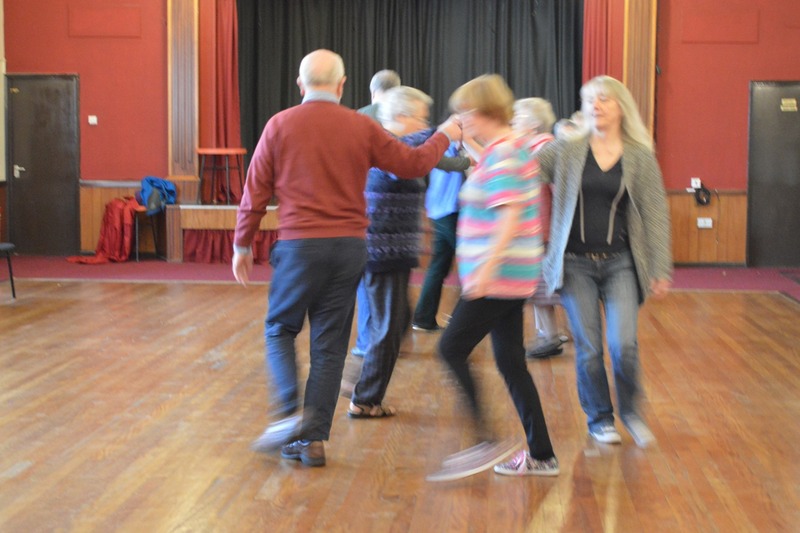 Country Dancing Group – 7.12.18 A special treat today as we danced to a live band The Lancashire Workshop Band and had refreshments afterwards. They kept us on our toes and we and the band earned those excellent refreshments. Young Phyllis of Wakefield another longways dance. Pine Cones a contemporary dance (1974) by Pat Shaw for 3 couples. The Drummer a longways dance & big favourite which we haven’t danced for a while, so very enjoyable. Trip to Sheringham a 4 couple square set dance which we danced twice. The Geud man of Ballangigh A Playford dance from 1728.
and to finish Guildhall a longways dance. there was dancing on the 14th but not recorded. No dancing until 11th January when Elfrida will be our dancing mistress, June Jones returns on 18th and anyone thinking of a New Year activity will be very welcome to join us then. Many thanks to June for another great year of Country dancing. Also her alternate Elfrida for keeping us dancing when June has a break. Hope you all enjoyed a good Christmas and have a Happy Healthy 2019. A few statistics:- from October 2017 – October 2018 we have danced 132 different country dances. 2.11.18 some Birthday requests for Pat Mc. & Wendy. Gasconne a longways dance from 1710 with a contemporary interpretation by Pat Shaw. Maiden Moor a 4 couple dance, choreography & music by Tom Cook & Brian Jenkins. Slof Galliard another 4 couple dance by Pat Shaw, danced twice & great when it goes well…a case of doing all the right moves but not necessarily in the right order on this occasion! The Disbanded Officer a longways dance from 1787. Welcome in the May a longways dance. The weather was not quite the same as when we danced this in May. Valentine’s Day longways dance.. from the Walsh collection 1718. Loose Ends a 4 couple dance with Pousettes & called by Elfrida. Sailor’s Wives a 3 couple dance x2, with chevron formation. Heidenroslein a 4 couple square set dance by Pat Shaw 1970.
and 10.11.18… Thanks & well done to the dance team and June…. Country Dancing at the U3a 15th Birthday party. Black Bess a longways dance from 1696. Wibsey Roundabout a contemporary 5 couple circular dance by Gary Roodman. Sea Breezes a 3 couple dance. The Old Mole an old traditional 3 couple dance dance from 1651, which has 6 parts to it, x2. ending with She looked down her nose and sneered, which has to be one of the most intriguing titles. 23.11.18 Elfrida & John calling the dances, thanks to them. A Fig for Bonaparte from 1804 a longways dance. Whim of the moment a longways dance. Braes of Dornach pub. J.Johnson 1753 a longways dance. Guildhall a contemporary longways dance by Naomi Alexander. Conway Castle longways dance requested by Geraldine. Marching to Praetorius a 2 couple square dance by Gary Roodman 1996. New German Waltz waltz rhythm from 1795. Lord Caernarvon’s Jig a 4 couple Playford dance. A treat next session 7.12.18, dancing to live music by The Lancashire Workshop Band. October – preparing for 15th U3a birthday demo! June has our full attention-ready to dance. 5.10.18 Thanks to Elfrida for recording once again. 12.10.18 ‘ the volunteer’ country dance group of 6 dancers (no room for more) practise their moves on stage. The following 3 dances are to be danced tomorrow at the party. Upon a summer’s day (wishful thinking) another 3 couple dance Playford style 1615. Leah’s Waltz a contemporary dance by Fried Metz Herman. Fourpence half pence farthing longways dance 1709. 19.10.18 Congratulations to the Dance demo team, well done. Whim of the moment longways. (The) Oldenburgh Bonnet a 3 couple dance. This refers to the bonnet worn by Lady Oldenburgh. It was quite a challenge ….but fun & danced twice. Fittleworth Frolic a circular dance. Pine Cones a 3 couple Pat Shaw dance from 1974.
and finally (The) Geud Man of Ballangigh 1698 a longways Playford dance. Whim of the Moment danced twice, longways dance. Tipoo Sahib another longways dance. Upon a summer’s day 3 couple dance. Indian Queen another longways dance. The Farmer’s Joy, a Joseph Pimentel longways dance. Lord Caernarvon’s Jig a 4 couple Playford dance, adapted by Cecil Sharpe 1910. Alexander’s Birthday a 2 couple square set dance by Gary Roodman for his grandson. He has named a dance after each of his 6 grandchildren. A clever dance, alternately dancing with your partner & your neighbour. Go to the Devil and shake yourself a longways dance with a terrible title! 21.09.18 Elfrida recording once again, many thanks to her. Jamaica a 4 couple dance. Current T.V series Upstart Crow uses the same music. Amazonian Archers a longways dance. Tambourine Dance. See last week. The Farmer’s Joy. See last week. All very enjoyable dances. Harlequin in the mud-longways from 1742 reconstructed by Andrew Shaw 2012. Another amazing title for a dance. ‘A circular dance under construction’ June Jones work in progress. very enjoyable. Five sessions of August country dancing. I looked for a holiday theme in our dances this month, and found a few:- Sea Breezes, and The Brighton Review seemed the most obvious. 3.08.18 Some of Wendy’s Birthday requests. Newcastle a 4 couple square set traditional dance 1651, which we danced twice. The Slof Galliard a Pat Shaw 4 couple longways dance 1975. A challenge but we rose to the occasion, twice. Nonesuch another traditional dance 1651 Playford, 4 couple longways, also twice. Heidenroslein another Pat Shaw 4 couple square set dance, waltz time. Black Bess Playford 1696 longways. Sea Breezes (3rd. version, June Jones choreography.) 3 couple dance. Sion House Playford 1701, longways dance. Mile of Smiles a Joseph Pimentel contemporary longways dance. The Brighton Review a longways dance. The Siege of Limerick Playford 1698 longways dance. Meillion, a 5 couple Welsh country dance, with clapping. Fittleworth Frolic a 5 couple circular dance. Of noble race was Shinkin another great title but what does it mean? Playford 1698, music from The Beggars Opera. 24.08.18. Elfrida is calling today’s dances. The 1st. of April (well we had April showers!) Longways dance 1773 published by Thompson. Wibsey Roundabout a 5 couple Gary Roodman 1995 circular dance. Our mechanics were a little rusty today! Birthday Reel a 4 couple dance x2. (The) Jackdaw a 4 couple Scottish dance. The Comical Fellow a longtime favourite, pub. Thompson 1776. The Farmer’s Joy a Joseph Pimentel dance 2012. Zig Zag Tuesday a longways dance. St. Swithin’s hornpipe a 2 couple dance. The New Exchange a 3 couple dance. Dunant House another 3 couple dance. 1.06.18 Elfrida recording the dancing today. Captain’s Maggot a 3 couple dance. Hyde Park a square set dance from 1651. Portsmouth longways dance pub. Playford 1701. Music- Portsmouth. (here’s a fact you can’t live without knowing, this was the signature tune to the Billy Bunter T.V series oh wayback! Meillionen a 5 couple Welsh traditional dance. Dutch House definitely a challenge for those of us left /right challenged. 15.06.18 Elfrida directing todays dancing. Faithful Shepherd a longways dance. The Gloster Reel a longways dance. Pine Cones a 3 couple Pat Shaw dance. Comical Fellow a firm favourite. Leaving of Liverpool a 3 couple dance. and finally Farmer’s Joy longways. 22.06.18 Elfrida recording the dances today. Summer Waltz another longways dance. Sailor’s Wives 3 couple longways with Chevrons! Whim of the Moment both longways. 29.0618 Double session today as June calling at afternoon Strawberry Dance Upholland. Broom the bonny Broom 4 couple longways. Playford 1651. Brighton le Sands a longways dance by June Jones. Practice of straight heys. 1st block of new English country dances for maybe 80 years, certainly since John Playford’s day. Written by Marjorie Heffer & William Porter from Cambridge. The Archbishop a 4 couple dance by Fried de Metz Herman, 1991. Music from Sellenger’s Round. Princess Royal a Pat Shaw longways dance. Wooden Shoes a longways dance. Welcome in the May. A most appropriate longways dance for this month and what a splendid month it is turning out to be. October’s child a dance by Ken & Naomi Alexander. Mount Hills a longways Playford dance 1721. Free flowing. Diversions. A longways Ellen Taylor dance 1980’s. Friday Frolic this could describe our weekly Friday dance sessions! Captain Cotton’s Maggot 1750 from Johnson collection. Wolverton Hall a longways dance. Chestnut 1651 3 couple Playford dance. Gued man of Ballangigh Playford dance 1698. 6.04.18 Elfrida calling today’s dances, our thanks to her. The First of April a longways dance, from 1773. The Farmer’s Joy a contemporary dance by Joseph Pimentel 2012. Whim of the Moment a longways dance, pub. Thompson 1791. John made his debut as a caller of dances & he made a great start. Criss Cross Jig a 5 couple dance. Comical Fellow from Thompson 1776. Guildhall a contemporary dance by Naomi Alexander. 13.04.18 June returns to call the dances & our thanks to her. Shrewsbury Lasses a triple minor dance. The Short and the Tall a 4 couple contemporary dance by Ron Coxall from the ‘Jogs to the Memory’ collection. We all need those at times! Holborn March longways dance from 1740’s. Nampwich Fair a longways dance. Fields End are both modern dances with unknown choreographers. My Lady Winwood’s Maggot a 3 couple dance. Love’s Triumph another 3 couple dance. 27.04.18 called and recorded by Elfrida. Birthday Reel (not celebrating anyone’s Birthday) A 4 couple dance. Holborn March a longways dance. Comical Fellow and Guildhall also longways dances. Nonesuch a 4 couple longways dance. Playford 1651 one of the first published. The Mulberry Garden a longways dance. Playford 1670. The Soldier and the Sailor another longways dance. Honeysuckle Cottage a contemporary dance from 2003 choreography Gary Roodman. In his classification this is one of his easier dances. I didn’t find it too easy! Fittleworth Frolic a circular dance for 5 couples. a lovely selection of names today. Young Phyllis of Wakefield a longways dance. Maiden Moor a 4 couple dance by Tom Cook & Brian Jenkins. The Spring another traditional dance. Thomas Bray 1699. The weather outside the hall was anything but Springlike & we didn’t have much Spring in our steps! The Bonnie Broom a 4 couple dance. Money in both pockets an early American dance about 1800. 16.03 2018 recorded by Elfrida. We had 16 dancers again today. Kind & Easy from 1716, longways which was anything but kind & easy. Arranged by Andrew Shaw, danced twice. June’s Challenge! a 4 couple set- Phoenix Rejuvenated, a Pat Shaw composition. Danced twice with slowed down music but we struggled with lots of 1/2 turns etc. Volunteers then danced it at the right speed. Gray’s Inn Masque a 4 couple dance. 23.03.2018 some deferred Birthday requests & some of Elfrida’s new ones. Spanish Jig (no footballing celebration today though) Walsh collection 1755. Childgrove 1701 Playford with various reconstructions, a longways dance. Trip to Bavaria a 4 couple dance, always a bit of a challenge but great when we get it right! For Rebecca a square set dance. A Lady Remembered a John Wood dance. Please note, no dancing next week as it is Good Friday. Returning on Friday 6th. April. February dances & ‘brain work’. Elfrida recording this session. June made our brains work today, lots of new dances! Maiden Moor – 4 couple, by Tom Cook 1980. An enjoyable dance. Kind and Easey – longways, Kynaston 1716 with Andrew Shaw adaptation, sedate. Sea Breezes – 3 couple longways, a June Jones composition. ( the name may change as there are other dances with the same name) An enjoyable waltz rhythm dance. The Werneth Wheel – 3 couple longways, not tried before & unlikely to try again. No Taxes – 3 couple longways, a nice dance. First of April – longways. Most straight forward dance to finish. The Whim of the Moment a longways dance, pub. Thompson 1791. * Picking up sticks a 3 couple dance Playford 1651 includes men & women’s ‘sheepskin hey’. There has to be something good about a dance that is still being danced 367 years later! Maiden Moor see last week. The Short and the Tall a 4 couple dance. The Devil’s Elbow a Ron Coxall dance, we are coming back to this one. Young Phyllis of Wakefield from the Walsh collection 1719 longways dance. *Gued man of Ballangigh Playford dance 1728. Marching to Praetorius a contemporary 1996 Gary Roodman dance, music by Michael Praetorius. Childgrove Playford 1701 with various reconstructions. *Indian Queen longways Playford 1701. *(J) Fandango a 3 couple dance with diagonal moves to keep us on our toes! Upon a Summer’s day another original dance from 1615 Playford. Jamaica 4 couple dance Playford 1670. Another year of enjoyable country dancing awaits. Many thanks once more to Dancing Mistress Elfrida for taking this session. When June has a holiday it’s thanks to Elfrida that we are able to have a dancing session, which we all enjoy. Farmer’s Joy a longways contemporary dance by Joseph Pimentel danced to a joyful tune. A very good start to the New year. The Jackdaw a Scottish dance for 4 couples. Loose Ends a 4 couple longways dance with Pousettes. Birthday Reel a 4 couple longways dance. Danced twice. Comical Fellow pub. Thompson 1776. 12.01.18 recorded by Elfrida. Welcome back June as Dancing Mistress. Heidenroslein 4 couple dance by Pat Shaw. A Birthday request carried over from last year for Geraldine. a waltz rhythm, nice dance elegant & sedate! Work in progress. A June Jones composition. Music Lord Foppingham. We’ve done this a few times & it’s not gone to plan but today we cracked it! A new German Waltz 1795. Longways, a waltz rhythm again, & another sedate elegant one. She looked down her nose and sneered Longways, with a courtesy turn. Diversions Longways. by Ellen Taylor from 1980’s. Peace be with you by Fried de Metz Herman, 1986, a longways dance. Pinecones by Pat Shaw a 3 couple dance with 1/2 Heys. Young Phyllis of Wakefield a longways dance from The Walsh collection 1719. My Lady Winwood’s Maggot. Playford 1726 a 3 couple dance. Maggot meaning a fanciful or whimsical thing. Grand Square a 4 couple square set dance. Sir Watkin’s Jig a 3 couple dance, pub. Johnson 1750. This & the next two dances all Liz’s Birthday requests! Slof Galliard a 4 couple Pat Shaw dance from 1975. A good video on You Tube. Turning by Threes a 3 couple, Gary Roodman dance from 2003. First of April longways dance, pub. Thompson 1773. Although we have a while to go to reach April it was lovely to have a Spring tune to accompany this dance. Ladies of London 1718 longways dance to music from The Beggar’s Opera. Jonda’s Jig a 3 couple dance with chevrons. Friday Frolic a longways dance. Scotch Cap 1651 published by Playford with diagonals. Have a look at William and Mary Heritage Dances video on You Tube. Fourpence Ha’penny Farthing 1709 longways dance Playford. Sailor’s Wives June Jones choreography, 3 couple dance with chevron formation. Albert’s Way (?) 4 couple dance. Queen’s Jig from Dancing Master 11th Edition. Playford, reconstructed by Cecil Sharpe 1911. Chestnut 1651 a 3 couple dance. This session was followed by our Christmas lunch at local hostelry. An enjoyable chance to chat & eat. 15.12.17 Short session with refreshments. Dancing recommences on the 5th. January 2018 with Elfrida, Dancing Mistress. June Jones returns on the 12th. When New members are welcome. *New (& old) dances in November. * Princess Royal a three couple Pat Shaw dance. A good video if you look for Pat Shaw dances. Mirror Me a three couple dance, 2007. Marching to Praetorius a contemporary dance from 1996. Freeford Gardens a longways dance by David & Kathryn Wright. 10.11.17 Elfrida recording the dances, continuing Geradine’s Birthday requests… Some quite challenging! * Welcoming the May – longways. * October’s Child – longways, Ken & Naomi Alexander, choreography & music. Jamaica danced twice. 4 couple dance. * Soldier & the Sailor – longways. 17.11.17 some more of Geraldine’s Birthday requests…. Morrison’s Reel (or Measure) a five couple Roy Golding dance. * Lyme Park a Triple Minor dance from 1791. Triple Minor dances were very popular in the 17th & 18th Century as the number ones are the main dancers giving the twos & threes more time/ opportunity to “flirt”. * Revolution de la France. It may look as if we didn’t do too much dancing today but we spent some time ‘perfecting’ the triple minor. D’Uytrechise Ureeden by Estienne Roger c1715. * Queen’s Borow a three couple dance. Fourpence Ha’penny Farthing published by Playford 1709. In December – 8th. Christmas lunch after dancing. 15th. Final dancing session before our Christmas break. Including Refeshments. Return to dancing on Friday 5th January, with Elfrida calling. GOOD WISHES TO ALL FOR A PEACEFUL AND HAPPY CHRISTMAS. October. Ten years of country dancing. Strictly speaking we celebrated 10 years of U3a Country dancing last month. On behalf of all current and former dancers a very big Thank You to June for leading us so well all these years. Whibsey Roundabout a 5 couple circular dance 1996 by Gary Roodman. 13 10.17 recorded by Elfrida. A busy session. Loose Ends another 4 couple set. Longways. more work in progress June Jones. Guildhall a longways dance by Naomi Alexander. A Lady Remembered by John Wood. For Rosemary. Maiden Lane 1650 from 1st Edition English Country Dances. Cecil Sharpe interpretation. 27.10.17 some 0f Pat Mc’s birthday requests. Trip to Sherringham 4 couple square set. Leah’s Waltz from Jane’s birthday requests. Hyde Park see 13 th. September, five Friday’s for dancing. Merry milkmaids 1615, one of the very early 4 couple dances. It would be hard to find ‘a milkmaid’ these days, merry or not. Trip to Sheringham a 4 couple square set dance, danced twice as we liked it. Hunsdon House 1657 another 4 couple dance incorporating ‘the grand square’. Hearstease 1651 a longways Playford style dance. a good selection of Traditional dances. Our thanks to Dancing Mistress, Elfrida, who took today’s session. Birthday Reel danced twice to 2 different tunes from the CD Orions Ring tracks 17, & 10, being today’s favourite. The Jackdaw a Scottish dance. Comical Fellow longways dance from 1776 published by Thomson. The Faithful Shepherd 1769 another longways dance. Criss cross Jig a 5 couple dance. A first for the caller & all of us, it went well. Holborn March 1740 a longways dance. Elfrida reporting a fun, action packed session. Jane’s delayed Birthday requests with some influence from Wendy! A selection of Maggots. Lord Byron’s Maggot, as one more dancer was needed, June danced with a ‘ghost’ always a challenge & a novelty for those who had not had this experience! My Lady Windward’s Maggot-longways 3 couple set, so we did it twice with some dancers changing in. Mr. Isaac’s Maggot challenging but enjoyable. Comical Fellow a favourite with Geraldine. Connaught Water a 4 couple dance by John Wood. Heidenroslein by Pat Shaw, music by Heinrich Werner, waltz time. Danced twice, I think this could become a favourite. It is Pat Shaw’s centenary this year. Marching to Praetorius 1996, a Gary Roodman 2 couple dance, Playford style in a square set. The music by Michael Praetorius. Star of Kintra by Thomas Monson 2004. There was some debate about the location of Kintra, it is a settlement on the Northwestern coast of the Ross of Mull. Barbarini’s Tambourine 1735, a longways set from the Walsh collection. Barbarini was apparently a dancer pictured with a full crinoline. As there is lots of ‘passing by’ in the dance it must have been quite a feat to accomplish. Captain Cotton’s Maggot 1750 from the Johnson collection. Ranelagh Gardens a June Jones dance, still in ‘a work in progress’ we last danced it in April. Farmer’s Joy 2012 by Joseph Pimentel. A joyous close to the session and the month of September. If it’s August it must be Whitby Folk week. We keep country dancing through August. The Welch dance (not a spelling mistake) danced to music from The Beggars Opera. Of Noble Race was Shenkin. Sailors Wives Choreography by June Jones. With a chevron formation. The Archbishop a contemporary dance by Fried de Metz. and The Braes of Dornach a 3 couple longways set pub. by Johnson 1757. Wooden Shoes a longways dance from the Dancing Master 1703. The Ladies of London 1718 another dance to music from The Beggars Opera. Of Noble Race was Shenkin which we did last week. A longways dance from 1695 John Playford. Chestnut a 3 couple dance from 1615. The Farmers Joy a contemporary dance by John Pimentel. Then we all enjoyed our Summer lunch at the Stanley Arms. Portabella a longways dance pub. John Walsh 1715/18. Lady Williams Delight a dance from 1989 by Rich Galloway. As June is at Whitby, Elfrida is dancing mistress & recorder. The Jackdaw x2 a 4 couple Scottish dance. Comical Fellow a longways set 1776 pub. Thomson. 1.07.17 The U3a Summer social & buffet with ‘entertainment’ from the Country dancing group. June called the dances and after a short demonstration there was lively dancing for all, accompanied by much laughter. Bonnets so Blue -longways dance. Wooden Shoes another longways dance. Meillion a 5 couple dance from Wales. The Ladies of London music from The Beggars Opera. ‘a work in progress’ by June Jones a longways dance, waltz time with’ hole in the wall’ crossing. Christchurch bells to a new tune. St. Catherine by the Neal brothers 1700’s. The New Exchange a 3 couple dance Playford 1690. Mile of Smiles contemporary dance 2012 by Joseph Pimentel an American. Mile of Smiles see last week, more practise gave much improvement, an enjoyable happy dance. Portabella a longways dance 1718. We last danced this in July 2016. Farmer’s Joy another dance by Joseph Pimentel 2012. Border Waltz country dance by Ellen Taylor – 3 couple set. De’il tak the War – 3 couple set , the Scottish lament. (The) old wife behind the fire 1726 Neal. In spite of this grim title, it was danced to a very jolly tune from the Beggar’s Opera. Old Hob or The Mousetrap a longways dance. Mirror Me a contemporary dance by Loretta Holz 2007. I think this may become a favourite. Welcome in the May. Is this the blossom or the month? Farmer’s Joy danced to another jolly tune. A lady remembered longways dance. Botany Bay. A Sicilian circle but danced longways. Winter in Brass town another contemporary dance by Philippe Callens a Belgian. Mirror me (see above) we danced this twice, so already becoming a favourite. A 3 couple dance. O’er the hills and far away. Shandy Hall a 4 couple dance by George Middleton 1977. Birthday Reel a 4 couple dance. Jamaica a 4 couple dance from 1670 Playford. Christ church bells in Aughton a longways dance. Holborn March a longways dance from 1740. Slof Galliard by Pat Shaw. 2017 happens to be the Centenary of Pat Shaw’s birth. Leah’s Waltz a contemporary dance by Fried de Metz Herman. Paisley Waltz a 4 couple square set dance. Take a dance a longways dance. Trip to Bavaria another choice of Wendy’s, a 4 couple dance. Trip to Sheringham a square set dance. Grimstock with 3 Heys, Grimstock, arches and circular. and hoping others will join us. Greenbank Park one of June’s dances premiered in July 2016. A 3 couple dance. Low Hill another of June’s dances including a Morris Hey, also 3 couple. Wits End a 2 couple dance. Gray’s Inn Mask 4 couple dance from Dancing Master 1651. Whim of the Moment Thompson 1791 4 couple. Trip to Bavaria 4 couple. Elfrida called & recorded this session with help from Greek Delight a holiday gift from Geraldine. June & Liz back from holiday. The Farmer’s Joy a 3 couple contemporary dance from 2012 by John Pimentel. We decided the joyful tune had something to do with the title but we could be wrong. Wits End a 2 couple dance by Bill Wolding. Love’s Triumph 3 couple dance (reconstructed from the original). Twas o’er the hills and far away 1715 a 3 couple dance. Indian Queen a longways dance published Playford 1701. A dance we know very well. Namptwich, the old name for Nantwich in Cheshire. Greenbank Park, a three couple dance, choreography by our own June Jones. Ranelagh Gardens was a famous pleasure garden in the time of Jane Austen. I don’t know if this has anything to do with the dance title. Liverpool’s Ranelagh Gardens 1722 where modelled on the London Chelsea garden. Mulberry Garden In contrast to the contemporary dances, this is from 1675. A longways dance, Playford style. The Fair American a longways dance. Guildhall, a contemporary dance by Naomi Alexander. Leaving of Liverpool a three couple dance. with one of our all time favourites completing the session The Drummer. Music by Brass Tacks. The whim of the moment published by Thompson 1791. Karla’s Waltz. Music by Celtic Rose. Our Taster sessions in January have produced some new and enthusiastic dancers so welcome to them. In addition to our usual Friday sessions, on March 7th. we had an additional dance, June’s significant Birthday Tea Dance, we were joined by Parbold & Upholland U3a country dancers and other dancers associated with June. It was a most enjoyable afternoon with live music from Denise and Norman Bearon. Thanks for all who contributed to make it a happy afternoon and celebrate with June. The whim of the moment a longways dance 1700 published by Skillern. The Old Mole a 3 couple dance in six parts. Fourpence halfpenny farthing Playford 1709. I wonder what the monetary value of this would be now? I missed the next few sessions but Elfrida recorded the details. If all the World were paper a 4 couple dance in square set. T for Technique/ Etiquette points. If there is a musical introduction, use that to honour one’s partner before starting the dance, as in Swirl of the Sea. Otterspool longways, Technique practice The Pousette, keeping straight lines, acknowledging one’s partner, trying to pause in unison, draw and full Pousettes. Calderstones longways. June’s choreography. Practice with dolphin hays. Music “Lord what comes to my Mother”! The baffled Knight 4 couple sets, if he was baffled, so were we, lots of hopping. Playford style. It came from a new crop of dances from a compilation called Maggot Pie in the 1930’s when people were being encouraged to compose new dances. Some were disastrous apparently! A Fig for Bonaparte longways 1804. 31.03.17 Elfrida not only recording but calling too. I make that 25 dances plus the Tea dance. Our new year starts with Dancing mistress Elfrida calling the dances. Spirit of France. Country dances of Colonial America. June is back taking the session. Go to the Devil and shake yourself. What an amazing title but we all seemed to survive! A fig for Bonaparte. pub. Thompson 1804. I care not for these ladies. A contemporary dance 1969 by Katherine Creelman. Sprigs of Laurel a longways dance. Belated Birthday requests from John. The Fair American, obviously enjoyed last week. Jack’s Maggot. Maggot being ‘a fancy’ not a slimy creature! Belated Birthday requests from Liz. Postie’s Jig. Another of John’s requests. Take a Dance. pub. Thompson 1765. The Introduction a Fried de Metz Herman 1999 contemporary dance. Practise makes for improvement. Peace be with you (another Liz request) and another of Fried de Metz Herman’s dances. Grimstock. Lots of Heys to dance. Hen Run which you can see on You Tube. Leah’s Waltz a contemporary dance 1989 choreographed by Fried de Metz Herman. A lovely flowing dance. Sellenger’s Round a circle dance. Meillionen a Welsh country dance. A very nice selection of dances. A Gary Roodman quote “After dancers have learned one of my dances, I would like the flow of the dance to seem as inevitable as the flow of the music with little need to concentrate on what comes next. I may not achieve that but I find the pursuit, great fun”. We’re working to meet Gary’s vision! CHRISTMAS LUNCH 9th December book with June. Dancing resumes after Christmas on 6th January. The Hen Run– Bernard Bailey. The music to this dance sounds a lot like chickens! The Belle of Amherst choreographed by Gary Roodman. 30th September dances all 3 couple..
Founder’s Day ” ” David & Kathryn Wright, another contemporary dance. and on to October 7th. The Introduction by another contemporary choreographer Fried de Metz. You Tube- just type in Fried de Metz country dances, well worth a look. with alternate Dancing Mistress Elfrida. and a right hand turn…. and a left hand turn. with lots of ‘Heys’ to practise…. Brighton le Sands (with straight Heys) choreography by our own June Jones. Consequences a 4 couple dance by June, the consequence seemed to be that the music got faster & faster! with another alternate Dancing Mistress Wendy. The Introduction another 4 couple. Lots of diagonals to keep us on our toes! Terpsicourante a Gary Roodeman dance from 2000. Quite a challenge, with lots of turning! Americans are obviously far less self conscious than us, happy to be filmed in the most amazing outfits! Indian Queen a good old favourite. We were challenged again this week. De’il tak the war – a Jacobean lament 1742. 3 couple longways set, danced twice it was so good. Pilgarlic followed by Mulberry garden. Whibsey Roundabout another Gary Roodeman dance which is very popular, no one gets to stand still. Fandango Playford style 3 couple, danced twice we have danced this recently and it is a favourite for many. Delia very different in style, think elegance, grace and ball gowns. Grimstock Hey. The Queen’s Jig 1701 Playford style with Cecil Sharp (banana) siding. T for technique. This dance move is characterised by good eye contact. Each person moves forward to their partner, making eye contact whilst they “banana” past each other in each direction. The Ragg danced last week but to a different recording. T for technique see below The Star. Take hands across, as if shaking your partners hand. Give the Star tension by keeping the elbow bent & helping to drive the Star around. 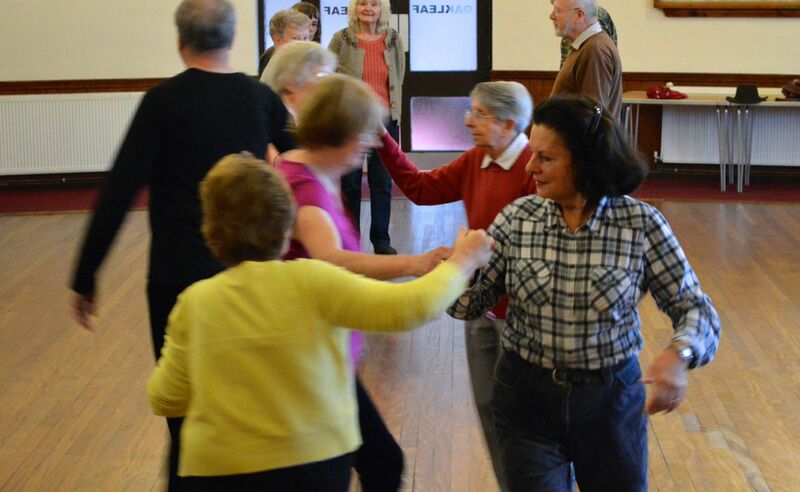 We do not have a holiday break from Country dancing so if you are at a loose end on a Friday morning at 11.00, now is your chance to try our country dancing group. You would be most welcome. We have had an enjoyable few months dancing many new and familiar dances. In MAY we joined the Parbold & Upholland U3A for a Tea Dance with live music and June calling, they kindly laid on an excellent afternoon tea which was delicious, however June made sure we all had plenty of dancing before hand. Many thanks to all who contributed to this event. Morrison’s Reel, Whibsy Roundabout, Peace be with you and Jenny Plucked pears. on 13th we danced Carla’s Waltz, Dunant House, Jenny Plucked pears again, a 3 couple dance Playford style 1651. Fandango 1774, very lively . on 20th Merry Andrew, The Old Mole 1651, Newsham Review, St Andrew’s gardens. June is trying to improve our Dancing Technique. Eye contact is characteristic of English Country Dancing and can be used to convey instruction, direction or traditionally, admiration, when there was little opportunity for conveying this. The Star, (or cross hands) it is important when taking the hand of the opposite dancer to create some tension or mutual resistance, this enables “the star” to move round with speed and ease. 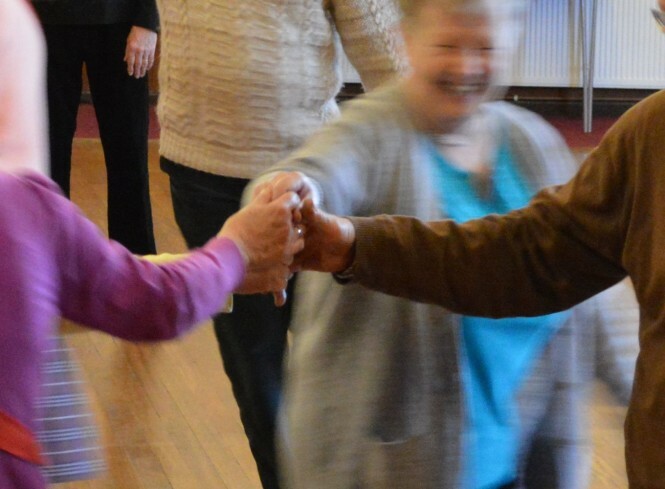 on the following week we danced St Andrew’s gardens again, sometimes we repeat dances either to improve on the previous session or just because we like them! The Belle of Amherst a Gary Roodman dance. Two waltz’s Wednesday waltz and Leahs then Leamington Dance. Fandango 1774 see www.dancevideos.childgrove.org Kensington Court one of the oldest published dances 1695.
on 10th we danced Oxford Circus a contemporary dance 1992 by Colin Hulme. Peace be with you 1986 a Fried de Metz Herman dance. Conway Castle, Portabella and Gloucester Reel completed the session. on 17th we danced Kensington Court again, Turning by Three’s a 3 couple Gary Roodman dance. We always enjoy his dances, they are all so very clever and different. Shrewsbury lasses, Pine cones by Pat Shaw. Finally Golden Dreams. on 24th The Rakes of Rochester 1748, Whibsey Roundabout another Gary Roodman! Conway Castle, Fandango and Peace be with you all recently enjoyed. Ending with Lord Byron’s Maggot. Into JULY when Wendy & Geraldine held the fort! on 8th His Royal Highness Prince of Wales Favourite (who?). Hot off the press! Greenbank Park, a June Jones World Premiere a 3 couple dance. Back to 1781 with New Rigged Ship from the Yorktown collection. Then a challenge Grimstock with lots of “Heys”. 2 couple sets from a Hornpipe, currently no name ( June’s composition) with a step-hop rhythm which was enjoyed so much they did it 3 times! June’s Joy was a title suggested from the dancers. Bonny Cuckoo was the final dance. Devil “tak” the war, 1772 a lament for all the men taken by War. A Summer Lunch followed at the Stanley Arms. Portabella was tried again twice and we almost perfected it! The Rotunda, as might be guessed a circular dance. Queen Elizabeth, Angela Rippon and Elfrida. What you may wonder do this group have in common? Two have had recent birthdays and all are fit for their respective age! Angela Rippon’s recent T.V programme How to Stay Young advocated dancing as one of the best ways to stay fit, although we had some debate as to whether we danced with sufficient vigour! On the 1st of April we danced Elfrida’s requests with some lively Jigs, Spanish Jig, Lord Carnarvon’s Jig. Liberty & Trip to Bavaria followed, also pretty lively. Meillionen a Welsh dance and Sallengers Round. Finishing with Comical Fellow 1776. There are over 10 videos of Sallengers Round on You Tube, take your pick. As it is a dance from 1670’s is obviously a favourite of many groups. We may have danced vigorously enough to fulfil Angela Rippon’s fitness criteria. Our next 3 sessions with Dancing Mistress’s Elfrida & Wendy leading. Liberty. Danced from the Yorktown C.D. The dances on this C.D are in the style of those danced at the Victory Ball after the Battle of Yorktown Virginia 1781, when the combined forces of American Continental Army and French troops defeated the British Army. They are a great collection of dances & tunes. Guildhall, Rakes of Rochester, and Indian Queen completed the session. Comical Fellow, Sprigs of Laurel, Indian Queen, Mendocino Redwood, Maids of March and Christ Church Bells in Aughton and The Drummer kept us busy for this session. Our 1st dance on 22nd. April was Jamaica. Acknowledging The Queen’s 90th. birthday yesterday, Birthday Reel followed, music Connaught Water. By a strange coincidence this tune was also listed for the next dance Trip to Sherringham. Elfrida found another tune Up and down the City Road, which caused some laughter as we felt we were in the school playground, but it worked! Guildhall, The Jackdaw, and finally Liberty. Our last April session we welcome back June, who has been laid low but is recovering. Some more dances from the Yorktown Victory Ball see above The Fair American, Boston Assembly followed by Freeford Gardens. Then 2 “Maggot” dances, a Maggot believed to be a whimsical dance; My Lady Winwood’s Maggot and Jack’s Maggot 1670, have a look at www.RegencyDances.org for a stylish performance with a good example of a Hay for three. Lastly Lord Phoppington. Please note there will be no dancing on Friday 25th. March Good Friday. More Birthday requests, Pat has her choices, Leah’s Waltz a contemporary 3 couple dance from 1995. Music-Amelia’s waltz. Scotch Cap 1651, 3 couple Playford style; October’s Child 1980 & Disbanded Officer 1789 both Longways dances. The following week’s dances included some we are demonstrating for a small Dance Display at St. Annes Church Monday group. Rostillion. Bonnets so Blue and Tipoo Saib an Indian longways set. On to Lady Winwood’s Maggot with trumpet accompaniment from Brass Tacks and then Black Nagg both 3 couple dances. Finishing with My Lord Byron’s Maggot and the popular favourite The Drummer. Thanks to Elfrida and Wendy for the above contributions. An enjoyable Dance Display and participation from the Monday club on 29th., see above. Conway Castle, Hop pickers feast 3 couple. St. James Park then The Chase a lovely circular dance and Elverton Grove a longways set. Dunham Oaks another Longways contemporary dance followed by Withsend a 2 couple set. Peace be with you 1986 by a Dutch choreographer, with the rather splendid name of Fried de Metz Herman. Jack’s Maggot an adaptation of a Cecil Sharpe original. Finally Newsham Review. Our last session before Easter. Our first square set dance was so new it had yet to be named (one of June’s) it worked well and I’m sure it won’t be long before we dance it again, with a name. This was followed by another very lively square set dance Trelawney. Jack’s Maggot again to see if we could perfect the Hey for 3. The brilliantly named “She looks down her nose and sneers” followed by Salutation, a dance in triple time. Last but not least a lively Jig. the Dolphin Hey, which looks really impressive, see below. Birthday Reel, Trip to Bavaria both 4 couple dances. Octobers child a Naomi Alexander dance from 1970. Postie, Morrisons Reel, & Gloster Reel. We danced into FEBRUARY with Kensington Court, My Lady Winwood’s Maggot. Maggot Old English meaning an eccentric or fanciful idea. A 4 couple square formation dance Trip to Sheringham, Leah’s Waltz & Mary’s moments. Sprigs of Laurel Thompson 1794, Indian Queen Playford 1695, Cecil Sharpe interpretation 1701, Maybird a circular dance, Oxford Circus Colin Hulme & Eastwell Park, all danced last week. our new year started with another ‘volunteer’ dance mistress, Elfrida and some favourite dances including Christ Church Bells (June’s choreography), Maids of March, Jamaica, Birthday Reel, Liberty and Sprigs of Laurel. June followed up this session ( 15th. Jan) with Wolverton Hall 1678, Kensington Court 1695, Braes of Dornach, Carshalton Grove, and a very nice circular more contemporary dance, I care not for these ladies by Kitty Creelman. Hyde Park a square formation four couple dance, Mr Haynes Reel a longways set, School for Scandal 1778 either 3 couple or triple minor longways, Braes of Dornach 1757 a 3 couple dance and Grimstock 1651 longways. If all these descriptions sound a bit complicated, it really just shows the variety of dances covered. As June explains each dance and we walk it through, it all becomes clear. June not only calls our dances but choreographs new ones. We have just danced St. James gardens & Calderstones, the titles seem to follow a local or Liverpool theme. More enjoyable dances Merry Andrew & Childgrove. Less successful was Absent Friends which won’t be repeated! As June is taking a break, one of our “group volunteer callers” Wendy is dancing mistress. (3 have been brave enough so far to try calling) with me assisting on the CD player. Mendocino Redwood 2009. This dance was created as the result of a Gary Roodman dance writing workshop, inspired by the class walking through the Redwood forest to the landmark Big Tree in Sequoia National Park. Gary Roodman’s dances are some of our great favourites. You might want to Google Gary Roodman. The Rakes of Rochester music by Handel. and finally another contemporary big favourite The Drummer with music from Brass Tacks. Following on from last week we completed a Birthday request list, some 10 dances! June hopes this will set a precedent for us all to emulate. Try to select 8 when it’s your Birthday, to help you with this, I plan to list each week’s dances for reference. Since June started the group over 400 dances have been attempted, some with more success than others, so there are plenty to choose from. Today we danced through the centuries from 1600’s to 1980’s.